Arenthia Swindler is an epic Agility creature card. It is part of the Core Set. "This one can deal with the likes of them." 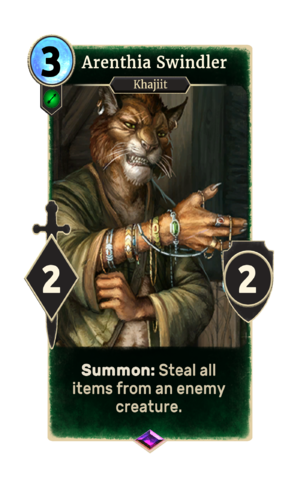 "If they have coin, Khajiit will take it from their corpses." "Khajiit is happy to oblige." "The hairless one must die!" "You will not feel a thing." This card's summon ability applies the Misdirection card effect. The card is named for the Valenwood city of Arenthia.